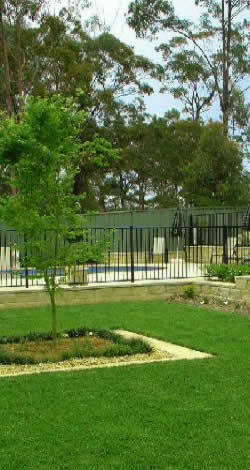 Sydney Landscape Management Services will supply and lay your new turf. 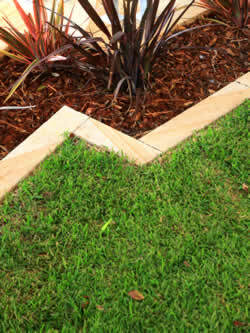 Our committed team of landscapers will help you choose the right turf for your landscaping project. When deciding which grass is best suited for your lawn we will take into consideration things such as soil type, water availability, and budget provided or if the lawn will be used in a high or low traffic area. Before laying the turf our landscapers must spend time on ground preparation. The weeds must be sprayed and the soil aerated and fertilized. The area can then be measured before we supply and lay your new lawn. When laying turf we start on a straight section such as the driveway or garden edging, it is layed firmly together in a brick style pattern. It is important to water new turf before it starts to dry out and it should be watered every day for the first few weeks until the grass roots firmly into the ground. Kikuyu - because of its affordability kikuyu is popular in both the domestic and commercial sector. It keeps its colour in the winter months but needs to be maintained in the summer months as it is a fast grower. Great for high traffic areas. Greenlees Park Couch - this is an improved version of the common couch. It grows well in semi arid conditions and is adaptable to its surroundings. Durban - is great for high shade areas and is extremely soft. This grass is low maintenance and will adapt to its surroundings. Sir Walter - is a buffalo lawn variety that has been grown in Australia for Australian conditions, it is drought tolerant and hardy. This grass is easy to maintain, soft to touch and keeps its colour in the winter months making it a favourite for home and business owners alike. Matilda - is also a buffalo lawn variety, is pet friendly and withstands all the punishment a pet can give. It is resistant to drought and keeps its colour throughout the winter months, it has a truly soft lush texture and is a firm family favourite.